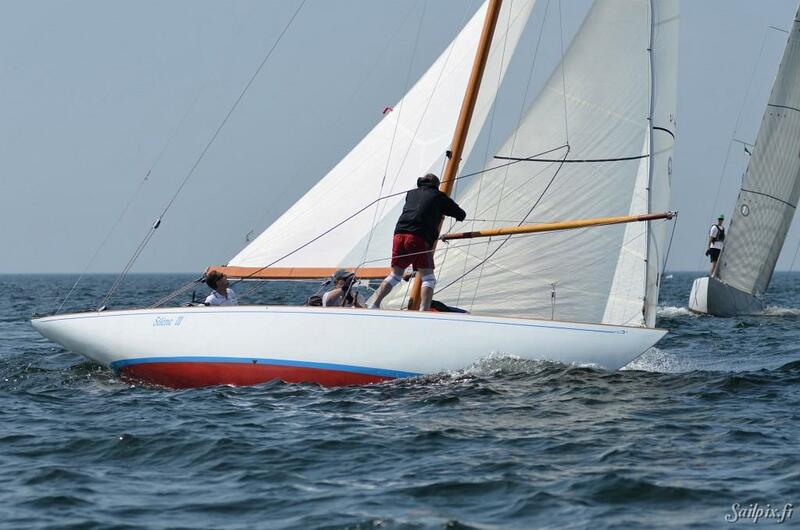 When it comes to meter boats the 6mR is in many peoples eyes the epitome of the gentleman’s racing yacht, small enough to be handled by a crew of 4 while giving exceptional acceleration and manoeuvrability in a class governed by a rule written back in 1907. Formed as an early Olympic Class for the 1908 Summer Games, the class was continued right through until the Helsinki games of 1952 after which time the 6mR was replaced by the new 5.5 meter class. The 1920s and '30s were often referred to as the 'golden age' of the Metre Rule boats and Sixes were most popular class, attracting the top sailors and designers to compete for prestigious trophies and Olympic medals. Many 6mR yachts were produced in countries all around the world, from the boards of the best designers of the day, William Fife, Olin Stephens, all trying to push the rule to it’s limit and leave their mark in sailing history. With such a collection of fine craft it is no wonder that the 6mR’s are so active on today’s sailing scene, with classics racing along aside moderns it is a tribute to the design and the builders. Over the years at Collars we have been involved in many 6mR rigs, and when the drawings for the E Holm designed ‘Silene III’ arrived in our office it all looks very much as expected. Silene III was built and launched in Sweden in 1950, and spent her early career between Lake Geneva and the Mediterranean, notching up many notable wins, she was a credit to her designer and skipper alike. In 1957 she lost her mast while competing in the famous 123km Bol d'Or race on Lake Geneva, and in 1967 her wooden mast was replaced with a fashionable aluminium one. With its two pairs of spreaders, heavy tip and the two forestays the new mast was too rigid and the extra weight was too much for her slender design. Although she still competed she had lost much of her competitive edge, doing well in the local regattas but not fairing so well against the newer 6mR of the day. In 1980 the decision was made to divide the class into the classics and moderns and with a lighter alloy mast once again Silene III brought home the trophies. In 1989, a change of ownership saw Silene III moved to Helsinki in Finland where to this day she has been lovingly looked after by her owner Tapani Koskela. With the long term plan of reuniting her with wooden spars, the research was done, designs drawn up and he set about the task to find a manufacture that could meet demands of producing a competitive rig whilst at the same time keeping within the spirit of how Silene III was designed. As with all racing rig, whatever the class, the main governing factor that has a direct effect on the performance is the weight, which in turn leads to the spars centre of gravity. The 6mR rule book clearly sets out the weight of the mast, including fittings, shall not be less than 63.51kg – so using the mean density of the timber the mast was designed to reflect this. The decision was made to use fine grain Oregon Pine opposed to Sitka Spruce, mainly due to it offering a stiffer section and lower overall volume due to being a stronger material. However unlike spruce where consistency is more predictable, pine can vary enormously in both weight and quality, so from the outset it was apparent that the success of the mast would largely lie on the initial choice of timber. For this requirement there was really only one option available when it came to sourcing what was needed, and the call was made to Tristan Stone of Stones Boatyard near Salcombe. Within a matter of hours we had a call back from Tristan’s father Jim, currently living in Vancouver, and as a professional boat builder turned timber importer, he knew of just what was needed and within a few days had inspected, passed it, and the deal was done. When the lorry rolled into our yard and pulled back the side curtains, before us lay 8 pieces of Oregon Pine, each 36’ long, 10” wide and 4” thick and not only virtually complete clear and with a ring spacing so tight it was hard to count; it was at this point the wait and cost seamed completely justified. Before simply ripping into the timber each piece was weighted, balanced and marked to decide where best to use them in the mast. Once the necessary decisions had been made the timber was sized, laid out and finally after 3 months of waiting, production had started. Like so many of the spars we build, there is more or less a set formula when it comes to the production, developed over many years and although it varies slightly from spar to spar the underlying principles remain the same. With Silene III we had to work backwards, from the final designed weight required to determine the hollowing which was reflected by the timber density, yet also taking into account that the internal moisture of the timber was at 19% when cut and therefore still in a position to release more and reduce it’s weight. The bulk of the hollowing was done on machine followed by the best part of a week by hand with a series of hollowing planes and a depth gauge. For the first time in our memory, the internal profiling of the spar took longer to shape than the outside, and once glued up no one would ever see the workmanship and hours that went into it – well hopefully never. The design services of Ed Burnett were once again called in to draw up the complete set of fittings, with the same parameters placed on final weight and center of gravity. Made locally to Oxford these were delivered to co-inside with the final shaping, and fitted to spar before being removed whilst the mast was passed through to the varnishing shop. Following 9 coats of high gloss Epifanes, all carefully applied by brush, the enjoyable bit starts of dressing with the new mirror polished stainless fittings. After pulling through the string lines for the internal halyards, the mast was give a final clean before carefully packing for delivery to Hull followed by onward sea freight to its eagerly awaiting new owner in Helsinki, Finland. I imagine there will be many amongst you wondering how the final weight and center of gravity ended up.